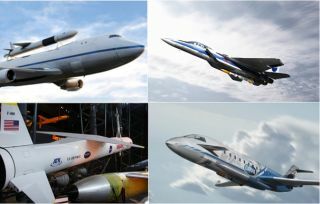 The Pentagon's DARPA research agency wants to create an airborne platform based on airliners to launch small satellites. U.S. military operations rely heavily upon satellites to spy on battlefields and coordinate friendly forces across the globe, but fast-changing ground conditions or enemy attacks on satellites can threaten to overwhelm the system. That's why the Pentagon has announced $164 million to turn airliners into airborne launch platforms that can send small satellites into orbit within 24 hours. An airplane-based launch means that the U.S. military could swiftly deploy satellites from any normal airfield, rather than rely upon expensive and possibly vulnerable ground-based launch pads. The Pentagon's research agency, the Defense Advanced Research Projects Agency (DARPA), also anticipates slashing small satellite payload costs from more than $30,000 per pound to less than $10,000 per pound — making such launches three times cheaper. Taking off from an airliner flying at 25,000 feet allows the theoretical space launch vehicle to start out above most of the atmosphere. It also adds a starting speed boost to the space launch vehicle, and allows designers to create a larger, more efficient rocket nozzle. DARPA wants the program to demonstrate at least 12 launches of 100-pound payloads to low Earth orbit, with each launch costing about $1 million. Launches could start as soon as 2015, according to DARPA's official announcement of the program on Nov. 4. The U.S. military has shown past interest in having the capability to quickly put new satellites into orbit. Its attempts to create flexible orbital spies include the reusable Air Force space plane, called the X-37B, which is currently on its second test flight above the Earth. Satellite replacements might also be needed in case the existing satellite network becomes disabled or compromised. Hackers have demonstrated their ability to interfere with U.S. government satellites, and countries such as Russia and China possess systems capable of shooting down or disabling satellites. But if the new program succeeds, the U.S. military could put new satellites or satellite replacements into any orbit without the limitations of fixed geographical launch pads. Anyone hoping to stop such launches would have to consider almost any airfield as a possible launch site. This story was provided by InnovationNewsDaily, a sister site of SPACE.com. Follow InnovationNewsDaily on Twitter @News_Innovation, or on Facebook.